As expected, Google this afternoon revamped Google Music, taking it out of beta, making it available to everyone -- and bringing online purchasing into the fold. That is, if you're in the United States. And outside of purchasing music, the service will remain free. "For music fans, we believe today's technologies ... bring with them the capability to dramatically improve the digital music experience, said Google's Jaime Rosenberg, director of digital content for Android." In fact, it's what consumers have come to expect." Just as with the beta service, you can continue to upload your own music to Google Music and stream it back to any of your Android devices. But the big change is in the Android Market. You'll now be able to discover, browse and purchase music from the Android Market. Everything in the music store has a 90-second preview, and songs are downloaded as 320kbps mp3s. Tracks will download directly to your music locker, so they'll be immediately available on all of your devices. Of course, Google Music's going social, and your friends will play a big part in helping you discover music. When you purchase music, you're given the option of recommending the music on Google + (and as e-mail links to your lame friends not on Google+), and they'll be able to listen to the entire track -- or the entire album -- for free. That sharing extends to Android and iOS devices as well. Googles' sweetened the deal with a bunch of exlusive, free music. The Rolling Stones have given six exclusive live records. Coldplay's given a live EP to the cause. Busta Rhymes (who was at the event in L.A.) is debuting his new album on Google Music. Plus, live albums from Pearl Jam, Shakira and the Dave Matthews Band. And Google's going to continue to give a free song a day -- it's given away more than 100 million so far. So who's on board? Three of the four major labels have signed on -- EMI, Universal and Sony. Google's also got a bunch of independant labels, and more than 1,000 total are a part of Google Music. Google's also given indepentent artists a place to share andn sell their music, with the Artist Hub. They can upload, set prices and have complete control over their content. So when will you get it? 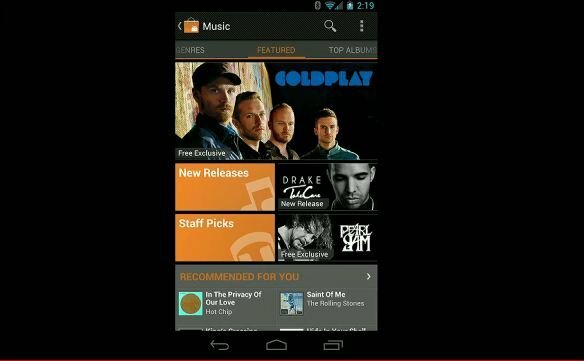 The new version of the Google Music app is available now, as is the new version of the web market. The Android Market will be updated for purchases over the next few days (though we fully expect manual downloads pretty quickly).